Ahh, Pokemon. That kooky phenomenon that captivated the world for a solid two years or so. This may sound insignificant in the vast enormity of pop culture history (and even more so if you extrapolate that figure to the dawn of mankind), but that is, in actuality, an incredibly long run for what some might deem a 'fad'. To be fair, Pokemon has more merit than the curios of yesteryear like Beanie Babies and Pogs, by virtue of the fact that it was built on the foundation of a video game that was actually incredibly good (albeit hugely flawed, if you're willing to incur the wrath of stubborn genwunners who have had their fingers in their ears for the last two decades), and as such, it has enjoyed great success to this day. But damn, to be a kid at the turn of the millennium when it was at its peak, it was something else, man. And other than everyone's third favourite rat Pikachu (behind only Mickey Mouse and Donald Trump), this formidable duo was at the forefront of the whole thing. Odds are, you have fond associations with your very first Pokemon, particularly their evolved forms, Charizard and Blastoise. ...Unless you were smart enough to choose Venusaur, that is. But hey, we can't all be luminaries. By the time we had reached 2006, Pokemania was little more than a collection of shrapnel scattered on the floor, threatening to be carried away by a strong Gust (it's super effective!) But I was still hooked. I am still hooked, obviously. I'm little more than a petulant man child who happens to be wearing a Litten hoodie at this very moment. And no, you can't have a photo. Our order was prompt; twenty chicken McNuggets, a quarter pounder and a Big Mac. ...Hmm, sounded more impressive at the time. And I lie, it was not prompt; I hesitated in my decision to go with the Big Mac. Foreshame, Tony. Possessing the sustenance, I peered up at the menu above. I keenly noted that they were still hawking their cheesy Happy Meal wares, and today's selection would be of the Pokemon variety. 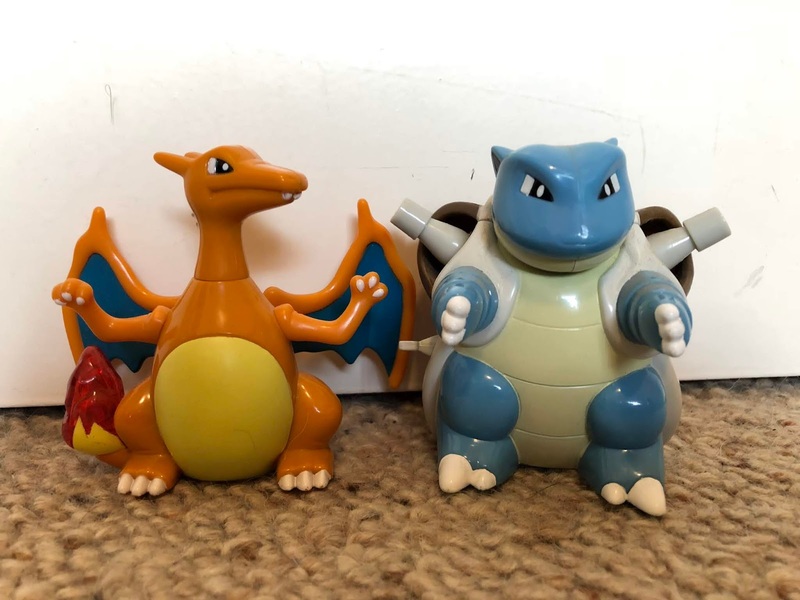 Ho-hum, how tacky, how 1997, how childish, how droll... OH MY GOD THEY HAD CHARIZARD. I will now admit, I get all giddy at the very mention of Charizard, simply because he's a massive angry dragon whose tail is on fire. He's everything I ever dreamed to be, and though in actuality he ranks like thirteenth or fourteenth on my list of Poke-preference (the upper echelons reserved for such legendary beasts of valour as Venusaur and Dragonite. Those are the money-mon), he was always meant to be the most utmost cool Pokemon. I mean, seriously, his trading card game card cost like $100. That's one expensive lizard. I had previously expressed my Charizard-fancy to Jessica (probably as an off-handed remark; 'Yes I'd like a coffee, and some scrambled eggs, OH MY GOD CHARIZARD RAWR'), and she could no doubt see the intensity in my eyes. She quickly asked how much the toy would cost on its own, and I was taken aback. 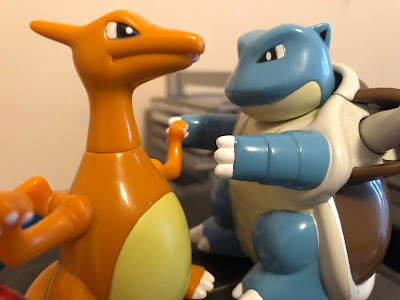 Sixty years from now, though there shall be a special place in my heart for my graduation day, wedding day, and the inevitable day I win the Superbowl, they will all bow down to the day when Jessica would buy me a Charizard. That, ladies and gentlemen, is the true mark of saintliness. ...After all, it's not like I was gonna ask for the friggin' thing, I look like a twenty-six year old stoner, don't need to act like one too. I merrily watched on with anticipation as the McEmployee sifted through her box of mystery for the Char Czar. She came back empty-handed, expressing that there were none available. WHAAAAAAAAT?? The sign clearly stated, AVAILABLE NOW. Had NOW expired in the duration of the last couple seconds? Was the Charizard on display in the case next to me mocking me at that very moment? I should have staged a McMutiny. I should have sent HER to St. Louis!! She did however mention that for $2 I could have a substitute Blastoise. Jessica asked if I wanted that one, and, save for the fact that I felt like a seven-year-old who was just denied his favourite toy, I couldn't help but pity the poor Blastoise. He's no fire-brandishing dragon, nosirree, he's a turtle with water cannons. He's like the G-rated Charizard. The Diet Coke of Charizards. What Charizard would be if he was a sissy. Whereas Charizard sits at a mighty 18 on my Poke-list, Blastoise probably occupies a conservative 35. I was still gonna get the Blastoise, oh hell yeah, but I was gonna sulk all the same. Additionally, keep in mind that the previous couple paragraphs all happened within the span of a couple seconds, which suggests that I really do ramble on. Funny how times have changed. Charizard later took a tumble down the power rankings, fuelled by my bitterness that it got such adulation where others would be forgotten. But enough about that. 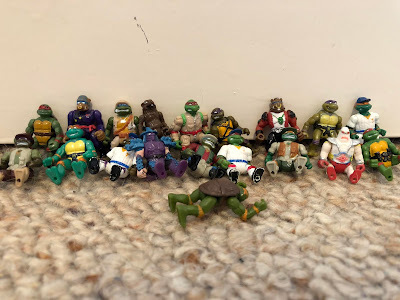 What of the toys themselves? They're both pretty damn cool. Quality figures, with their own little quirks and hidden abilities. Charizard's tail lights up with the fury of a thousand suns (or at very least, an alkaline battery or two), and if you press a button on its back, its wings wiggle. Barely. When I unearthed it from the drawer, it was doing its best Sephiroth impression by being a one-winged angel, and even after I had tracked down the missing appendage, its movement is particularly unmoving. It may have to take these broken wings and learn to fly again, learn to live so free. Blastoise don't mess around, on the other hand. It's a wind-up toy, and boy howdy does it go like the clackers. Its hydro cannons poke up and down as it powers along, and its arms are outstretched in the ultimate display of aggression. Plus, it just has this look of genuine unhappiness on its face that I can only assume comes from having been dismissed as my 35th favourite Pokemon twelve years ago. In hindsight, there was probably a more academic way to solve that.